I intended to save the Mahler symphonies for the end of this study, but when the Oregon Symphony presented Mahler’s Third last year and his Second last week, these seemed like appropriate opportunities to reflect on this glorious music. In addition to the chapter in Michael Steinberg’s The Symphony: A Listener’s Guide (New York: Oxford University Press, 1995), I went back and reread from David Hurwitz’s The Mahler Symphonies: An Owner’s Manual (Pompton Plains, NJ: Amadeus Press, 2004), Constantin Floros’ Gustav Mahler: The Symphonies (Portland, Oregon: Amadeus Press, 1985), and Deryck Cooke’s Gustav Mahler: An Inroduction to his Music, Second Edition (Cambridge: Cambridge University Press, 1988). These are all excellent guides though each of these authors takes a different approach. Hurwitz is the most approachable. He is focused primarily on the music but speaks enthusiastically in layman’s terms about it. Floros goes into great detail about the origins and context of this music and provides a highly technical analysis of its structure. Steinberg is somewhere between them, providing context for and explaining the music at a higher altitude. He seems most committed to the idea of a narrative structure for his writing. Cooke’s book is the most indispensable. It is densely packed and tackles most directly the issue of the meaning of this music. In addition, I listened to the lecture that was created by Benjamin Zander to accompany his recording of this symphony. It’s nearly as fun listening to his lecture as to the performance. As a conductor, Zander brings a particular enthusiasm for trying to communicate what’s going on in this music. There is one gorgeous passage in the first movement that is striking with Zander’s narration of it. It’s wonderful, like listening to Vin Scully call a Dodgers game. If symphonies were children, each of Mahler’s were astonishingly unique, with big personalities and yet, clearly, part of the same family. The Second Symphony comes in the middle of a progression from big (the First) to gargantuan (the Third). They are competitive, each making a statement, the First attempting to outdo previous symphonic practice and the Second and Third each more expansive than the one before it. And then the Fourth comes along as a reaction, introducing almost Mozartian stylings and proportions (comparatively). Mahler wrote program notes for this symphony, which are helpful to make some associations with the music. Though he later withdrew these notes because he didn’t like the idea of a “crutch” for the listener, the title, “Resurrection,” sticks because of the text in the finale. The orchestra for this symphony is enormous, including my favorite … ten horns. Mahler’s creativity with the big orchestra is phenomenal. It’s not loud all the time, though when it gets loud, it’s really something. Living in this culture, you get used to loud sounds, but there is such a difference between volume produced acoustically by people through instruments and volume produced by electricity and amplification. Mahler’s is sparing in his use of these enormous resources, so that while this is a big work, it’s surprisingly intimate as well. It really is chamber music much of the time, with all sorts of interesting instrumental combinations. There is a great moment in the last movement when a solo flute is accompanied by an off-stage band. A significant number of the performers—the choir and organist—participate in just the final ten of the 78+ minutes of music. As a composer, Mahler is looking both forward and backward. He is connected to the past and yet so original in the moment that his music still feels fresh today. When Mahler received criticism for lack of counterpoint in his music, he went back and studied Bach before creating his Fifth symphony. Mahler uses instruments and combinations which, if they weren’t used by him for the first time, were certainly used most strikingly. Among the joys of his music is the way it contrasts so much. He takes very simple forms and creates profoundly original and nuanced creations from them. Mahler certainly makes an impression. The symphony has five movements. And because a choir comes in at the end, it does seem like Mahler was imitating Beethoven. (The comparison of Beethoven’s Ninth and Mahler’s Second was the subject of a college essay I wrote, the whereabouts of which I wish I could determine.) But where Beethoven’s cellos in the opening of the fifth movement rejected the previous four movements before introducing his “Ode to Joy” theme, Mahler takes what has come before and transforms it. While both the Beethoven and the Mahler are inspirational at the end, the way they go about it is world’s apart—for starters, Beethoven moves things along quickly using tempo to create energy while Mahler takes his time. The “Resurrection” Symphony is a dramatic musical event, but I don’t know that it follows a typical dramatic arc. For me, the emotional content is so heavy in this symphony that it’s an inverted arc, which takes you down and down until the final moments. I’m playing with a picture of the emotional line of this symphony. I’m not sure it’s quite right, but it’s how I see it these days. As far as musical drama, what Mahler is doing is unique. The typical dramatic pyramid includes rising action that leads to a climax before a denouement. Instead, Mahler takes us to the depths. Rather than building tension, Mahler increases the sense of despair before, ultimately, lifting us to new heights. In the first movement there is a death. 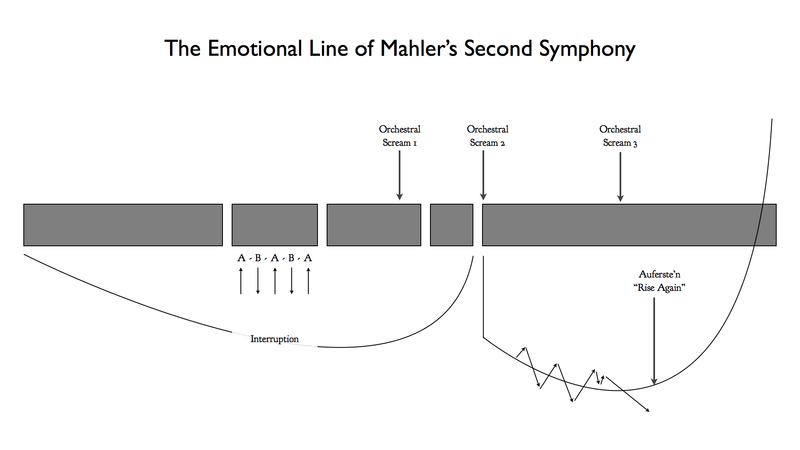 Because these symphonies are often both intra- and inter-connected, Mahler has noted that this death is that of the hero of his first symphony, which metaphorically is probably Mahler as these are somewhat autobiographical works. There are a number of motifs in this first movement, but the main point is that there are descending lines and ascending lines—darkness and light—that are in contention throughout the movement, indeed throughout the symphony. Darkness will rule the day in this first movement and gets the last word at the end where you get this series of major chords, which sound like the movement could end positively. But underneath is this menace in the rumble of the percussion and low strings. And then a trumpet turns the major chord minor and everything comes crashing down. Two quiet thuds indicate it’s over. The second movement is a moment of earthiness in a symphony about ultimate things. If the second movement is a kind of reprieve, it is just barely so. The form of the second movement is A-B-A-B-A. The A sections are based on a simple, Austrian Ländler. I love how Mahler so often alters material when he repeats it. The first A section is that lovely tune. The second A section is that lovely tune with a beautiful counterpoint in the cellos. The third A section has the strings playing pizzicato in a delicate way, sort of like a music box, with little punctuations by the flute and piccolo. Here are brief excerpts of the three presentations of this A theme. Of course it’s not all sweetness and light. Separating these delightful moments are the B sections, which introduce a restlessness and anxiousness to this otherwise restorative music. The music in this movement is varied–there is “humor” as well as “lyric” and “solemn” elements, but there is a “sinister” quality, too. (Floros, 64). I would add that it often sounds sarcastic. 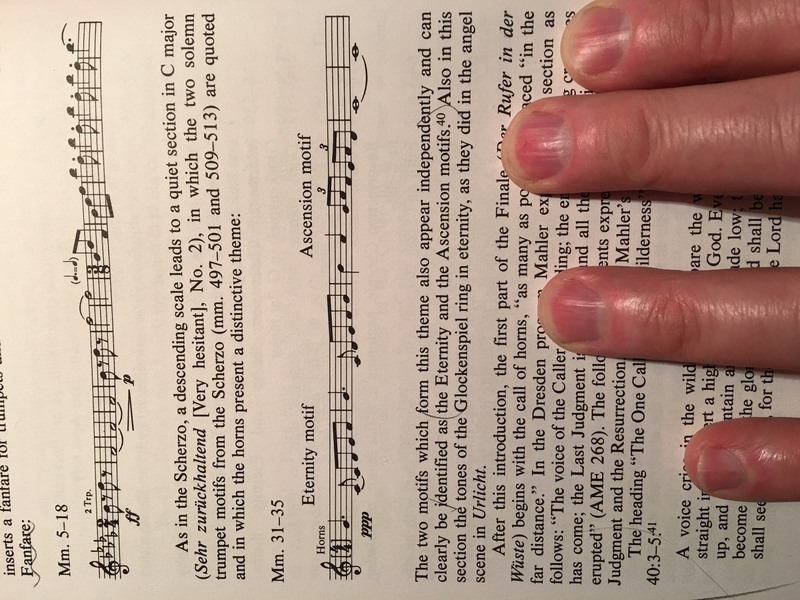 Steinberg writes that this movement includes “a certain element of the groteque.” (Steinberg, 287) Near the end of this movement is a colossal scream from the orchestra that will return in the final movement. Zander in his lecture maintains that Mahler is the first composer to introduce intentionally ugly sounds into a symphony. Here is that first scream. It’s unsettling. But it seems (at least in the moment) it was all for naught. This lone voice is quickly crushed as the last movement follows immediately and opens with that orchestral scream and we begin another descent into darkness. The last movement is the longest. There are moments of light, but as in the first movement they are reversed, until the ultimate reversal at the end. It’s a culmination for which Mahler is in no hurry. After the turbulent opening things quiet down and we get to hear a couple of interesting effects for horn. I mentioned earlier the symphony was scored for ten horns. The presence of ten horns provides the opportunity for some big sounds, but early on in this movement Mahler goes the other direction. The following clip has two examples—the first has horns at ppp playing what Floros identifies as the Eternity and Ascension motifs. The second, and just a short moment later, has off-stage horns playing to sound as though they are off in the forest, a great distance away. Both examples show Mahler’s ability to use restraint, one by a notation of dynamics and one by a placement of the instrumentalists. “we are confronted once more with terrifying questions. A voice is heard crying aloud: ‘The end of all living things is come—the Last Judgement is at hand’. . . . The earth quakes, the graves burst open, the dead arise and stream on in endless procession. The great and the little ones of the earth—kings and beggards, righteous and godless—all press on; the cry for mercy and forgiveness strikes fearfully on our earts. The wailing rises higher—our senses desert us, consciousness fails at the approach of the eternal spirit. The last trumpet is head—the trumpets of the Apocalypse ring out; in the eerie silence which follows, we can just catch the distant, barely audible song of a nightingale, a last tremulous echo of earthly life. A chorus of saints and heavenly beings softly breaks forth: ‘Thou shalt arise, surely thou shalt arise.’ Then appears the glory of God: a wondrous soft light penetrates us to the heart—all is holy calm. When Mahler says “the glory of God” appears, he does his best to illustrate it through music. The question that listeners must ask is how well did he do? On the one hand, it’s seems the height of arrogance to claim to be able to depict the glory of God. On the other hand, if the heavens declare the glory of God, perhaps other elements of creation should at least make an attempt. The only problem is that Biblically-speaking, God’s glory is often cause for a human’s undoing (see Isaiah 6). This glory is more thrilling than terrifying. The Oregon Symphony played marvelously, although I will say I found myself in evaluative mode for the first two and a half movements. The first movement felt a little fast. That English horn solo referenced above in the first audio clip, went by so quickly. I wanted just a little rubato. I thought the same thing about the second movement. It felt unnecessarily driven and a little mechanical—so clean and precise, but sterile, lacking any give—no pulling back or pushing forward. The first orchestral scream really drew me in, though, and the rest of the performance was thoroughly compelling and enthralling—a fabulous concert. I have no memory of the Oregon Symphony ever performing this work. It may be that there wasn’t a lot of risk taken with tempo because it was unfamiliar and it was more important for it all to hold together when so much is on the line. If they were going to perform it again in, say, a year or so, you wonder what kind of nuance they would add. A performance is a moment in time. But my sense is that this is an orchestra that is getting better, if it’s possible to say that without sounding condescending, particularly when you are talking about people who are far better musicians than you are. While the concert was an unqualified success, I feel like you always need to have an asterisk with performances at the Arlene Schnitzer Concert Hall. You want to say that they performed well in spite of their surroundings. (Or if you don’t care for the performance, you wonder if the concert hall itself was part of the problem.) It’s a very cramped stage and so it has to be extended to make this Mahler orchestra possible. The stage is littered with devices to protect players from the instrumentalists behind them—the bassonist from the trumpets, the horns from the percussion, etc. You wonder what the sound would be like in a larger space. And the building itself lacks resonance. How would the strings sound in a more vibrant room? My memory of Mahler’s Third last year is that the strings sounded seriously under-powered. At this concert, their numbers and sound felt present. I could still take more string sound, particularly from the low end, but it seems like they may be bowing pretty hard just to be heard. My not careful count of the strings was 16-14-12-10-8. I feel like the brass (trumpets and trombones) could back off. Still, balance was good with the exception of the harps, which seem to have the same problem as the strings, and some of the percussion—tam-tam and rute, especially—were unnecessarily subdued. It could be, though, that on stage the percussion is just too much and they need to stay in a metaphorical box for the orchestra to function. For reference purposes, I listened to a performance by Markus Stenz with the Melbourne Symphony Orchestra. This is a fascinating comparison. Their performance hall has almost too much resonance so that every note nearly sounds twice. The one disappointment about the concert came before the performance at the pre-concert talk. The host, Robert McBride, interviewed the conductor, Carlos Kalmar. But the conversation didn’t feel well-planned. For example, McBride asked Kalmar what he was looking forward to performing next season even as he admitted he couldn’t remember what had been scheduled. Wouldn’t it have been helpful to bring a list of concerts for the 2017–18 season, mention a few of the concerts, and ask the conductor which of these concerts he was especially looking forward to conducting? Or, better, spend more time talking about the great work of music that was going to be performed within the hour. McBride later suggested this was a great time of year for this symphony to be played. I thought he was going to add because we were in the weeks following Easter, but he referred to Spring and the way everything comes back to life. I hope I’m not too pedantic when I say that this is a work about “resurrection” and not “rebirth.” While Mahler was certainly not an evangelical Christian in his thinking, he was not talking in a general way about how life comes out of death, but in a very specific way about how life will come after death. For me it’s a statement of faith, not observation; it’s about rising from the dead, not a renewal of life. On the other hand, it’s not like the idea of rebirth isn’t a Christian idea (see: Nicodemus, the Gospel of John chapter 3). Here is a link to a upbeat article that begins, “Mahler’s Resurrection symphony is basically great, and we’re about to tell you precisely why.” Basically great. That’s exactly how I feel about this phenomenal work.